Septic System Maintenance Tips and Tricks - Septic Tank | Willey & Co.
Much like the tradition of setting your clocks back (or is it ahead?) and changing the batteries in the fire beeper thingy, spring is a time to maintain your property. This includes pumping your septic system and performing much needed maintenance on the components of your system. Depending on your system, regular maintenance items may be included and should be periodically inspected or changed. At Willey & Co we install septic systems in both commercial and residential settings. General maintenance is really something that should be done by a professional, for no other reason than septic tanks can be dangerous if a person were to fall into the cover. That being said, there are plenty of things you can do to make sure your septic system stays in good working order. Every year the government looks though a bunch of appliances, like dishwashers and washing machines, and determines their energy efficiency rating. No doubt you have seen the ENERGY STAR logo when buying an appliance or electronic device like a computer monitor. The ENERGY STAR rating makes it easy to find an appliance that will save you money by utilizing less water or energy. Look for the ENERGY STAR rating when you are purchasing an appliance and know that you will be saving money and helping out the environment at the same time. One of the major water consumers in your home is the washing machine — the average household will do about 300 loads of laundry a year. That is a lot of lost socks. The old washers were top loading and would fill up with gallons and gallons of water per load. These washers washed your clothes in an incredibly inefficient manner, meaning they wasted a lot of energy and water to do the same job that new ENERGY STAR certified washing machines can do. Not only are these machines bad for the environment but they would also inundate your septic system with water, which could lead to overflow over time. Using an ENERGY STAR washer is one of the best things you can do for your septic system. Your dishwasher is a big water consumer in your home and many of us either don’t want to, or don’t have time to do the dishes by hand. Upgrading your dishwasher to an ENERGY STAR certified model is easy and it will help save you money and water. New units generally have a superior filter in order to release water that is free of large particles of food. The last thing you want is an excess of solid food to make its way into your septic tank. The average home uses more than 15 percent of its water through the faucet. This means that all of that water is eventually going to make its way into your septic system and the more water you dump down the drain, the faster your septic system fills up. While it may be hard to think about how to save water when thinking about your faucet, it can be quite easy with modern science. Well, maybe not science, but utilizing restricted fittings can save a third of the water that you were once using. The same goes with low flow toilets and shower heads. Your toilet and shower can be made much more efficient and will help you save money. There are many ways to help cut water use which will have an effect on the health of your septic system. Think about how much water you use annually and make steps to reduce your water consumption, Your septic tank and your bottom line will thank you. These days your average home has a garbage disposal in the sink, regardless of whether it has a septic system or not. A garbage disposal is one of the worst things you can do to a septic system. It is the septic equivalent of putting sugar in someone’s gas tank. Okay, maybe it is not that bad, but a garbage disposal is not good for a septic system at all. The food that will be introduced into your septic tank will not break down like the solids that are normally introduced and can lead to clogging of the leach field and overflow. Excessive food waste and grease can also upset the delicate balance in the tank and eventually the biological process will not work as it should. So if you have a garbage disposal, and plan on using it, it is a good idea to factor in a yearly septic tank cleaning. 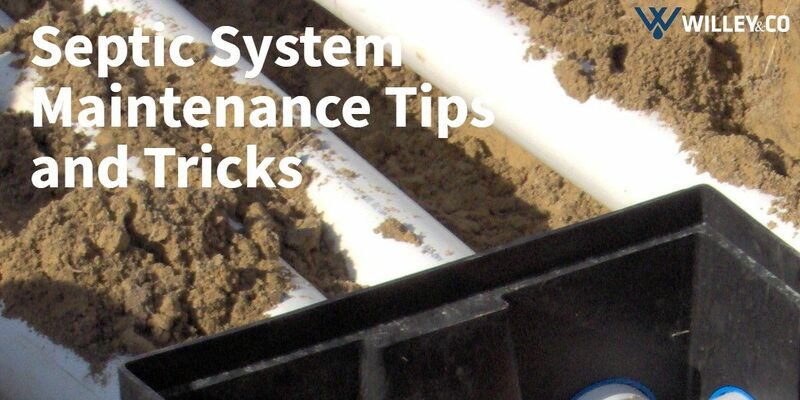 Be sure to come back next time for more tips and tricks to keep your septic system in the best shape possible. Of course, if you need any more information, please do not hesitate to contact Willey & Co for more information. While we are experts at septic installation, we are also one of Sussex County’s most trusted irrigation installation and well drilling contractor. Contact us today and let our 40 years of experience work for you!